5.1.2014 [cont'd from 4.25.14] I'm continuing with my evening hand-stitching, aka embroidery. I was going great guns, finishing one each night and posting it on Flickr. Then I had to get complicated. First, when I post on Flickr, I like to caption my photos. Who stops to look at "DSC03516"? While I'm naming, why not get a little poetic? 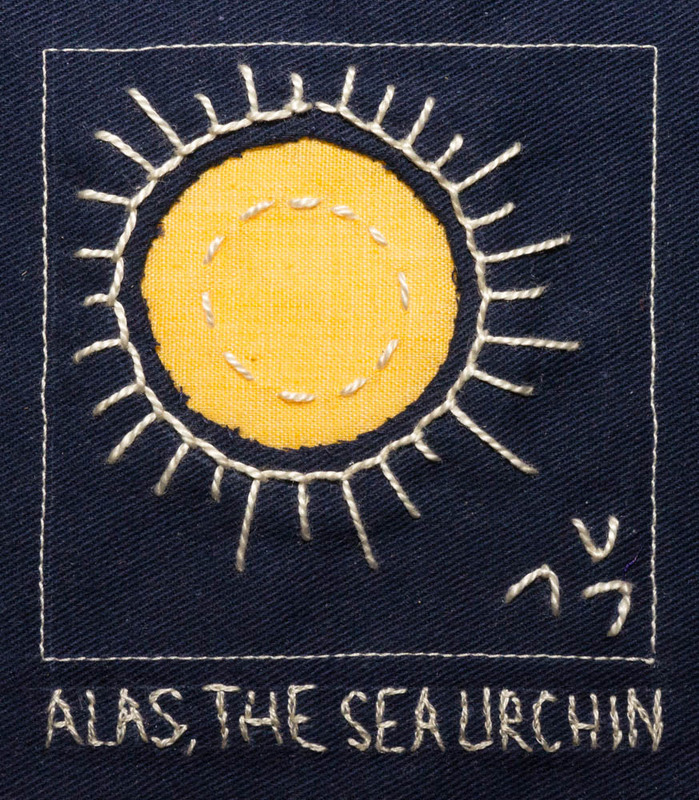 The piece above -- where I added the complication of reverse applique* --is obviously a sun. But no, I had to squeeze my eyes till is became a sea urchin. Meanwhile, I'm reading "The Subversive Stitch: Embroidery and the Making of the Feminine" by Rozsika Parker (1984). It reminds me that in my 1950s childhood, girls were taught embroidery to demonstrate their gentility. I have vague memories of "hope chests," where young women stored their embroidered tea towels and tatted doilies in breathless anticipation of marriage. This was all a throwback to 19th-century Victorian times, when (according to Parker) embroidery symbolized the chastity and meekness of the stitcher. Good girls, refined girls embroider. The wheel goes round. Embroidery is back. It is more likely to be called "handstitching" now, as one component in the needle-arts boom, which includes the big business of quilting. I just picked up two recently published books: "Creative Stitching" by Sue Spargo and "Modern Hand Stitching" by Ruth Chandler. Both teach the classic embroidery stitches, but show them being used in wild freeform designs, combined with applique or whatever strikes their fancy. No delicate daisies on wispy little stems. Very liberating. I'm happy to reclaim what I once rejected as too old-fashioned. Like the song says, "everything old is new again." * REVERSE APPLIQUE: applique is behind the ground material, which is cut away to reveal it.